Is It True That Chocolate is Good For You? 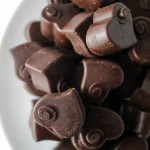 Chocoholics take heart – literally that is! Seems that a bit of the old chocolate bar might actually be good for the ticker! Finally, a comfort food that we can all live with – in moderation of course! Several studies have concluded that the flavonoids in dark chocolate may actually be beneficial to your health in numerous ways. These studies don’t exactly suggest that you run out to the store and consume five or six candy bars. Certainly not, given that the sugar and fat content in most candy bars would actually have a detrimental effect on your health. However, various research studies, conducted in the U.S. and Switzerland, have concluded that chocolate flavonoids give short bursts of energy to the brain and are useful in combating fatigue and sleep deprivation. In fact, they may even counter the effects of aging, such as dementia, because they increase the flow of blood to the brain! Some research experts say that epicatechin, a natural compound found in cocoa beans, may be as important in combating disease as penicillin. A study of one Central American Indian tribe, the Kuna, who drink up to 5 cups of cocoa water each day, showed they suffer less from high blood pressure, cancer, heart disease and strokes than people in more developed countries. It is believed that epicatechin improves circulation and relaxes blood vessels. In addition, a research team from the Finnish universities of Oulu and Helsinki has been studying a group of Helsinki executives, born between 1919 and 1934, since the 1960s. Their findings? The chocolate-lovers in the group tended to be leaner, have a lower incidence of diabetes, and were better educated than those who consumed other sweets. In addition, they tended to be happier and suffered less depression, probably because eating chocolate also releases endorphins in the brain, which produce pleasurable feelings. So go ahead and indulge in some dark chocolate…you might just make you feel better for quite some time!